The web is main platform for online content for desktop computers as well as for mobile browsers on handheld devices, despite the popularity of platform-specific phone apps. The web is the first place where free content should be published online. HTML is the language used to create web sites displayed by desktop browsers and to make content available to web browsers on mobile devices. The current standards are the best option when coding HTML for mobile devices, especially compared to HTML 4 from the late 1990s. They are a must for development using progressive enhancement principles, which provide a rich Internet experience on all types of devices from small screen handhelds to pads and tablets in addition to desktop computers regardless of the user's browser of choice. (This was one area where designing for a specific browser, usually IE, then attempting to support other incompatible browsers and devices through graceful degredation failed - see Progressive Enhancement: Paving the Way for Future Web Design .) Visit HTML-5.com using the web browser on your smart phone to see what mobile web design with HTML 5 looks like. 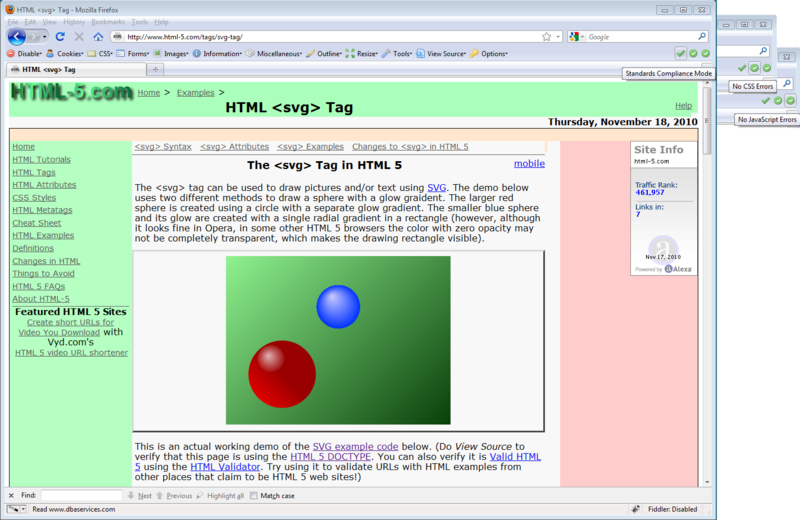 November 23, 2010 - The W3C releases an update of the modular specification of the HTML language. This Second Edition is the first Technical Report from the HTML Working Group advanced from a Working Draft to a recommended standard since 2001. See History of HTML Versions. HTML 5 is the base standard for current and future implementations of HTML. It provides good backward compatibility with both the 1997 HTML 4 standard and the 2000 W3C Recommendation versions of HTML, as well as some new features that finally move forward beyond those decade-old standards. If each browser vendor did things totally different, developers would be unable to predict how their web sites would appear. Therefore, all modern desktop and mobile web browsers need to support the features of the HTML 5 specification at a minimum, as a strong foundation for displaying web pages as they were intended to be seen, and then enhance the user experience to improve the adoption rate by Internet users. The HTML 5 specification does not cover all valid markup in standards-compliant HTML documents. For example, mathematical markup and Scalable Vector Graphics are valid in HTML documents but are convered by separate MathML and SVG standard specifications, respectively. Since the purpose of the HTML 5 specification is to provide a solid base for HTML coding and parsing, once it has been finalized it will not be changed (except for possibly documenting some errata). New features added to the HTML language are considered to be beyond the HTML 5 base level specification. Going forward, in order to allow for enhancement of the markup language, HTML is now considered to be a living standard, which will continue to evolve over time. For example, new HTML tags, such as the <device> tag, can be added as the needs arise and as browser vendors can reach a consensus on their implementation. But again, this site concentrates on the rules for web designers. For full details on the HTML 5 specifications, see the Draft Standard on the W3C web site or the WHATWG site. As indicated above, HTML 5 does not cover all aspects of web content development. There are related web application APIs and other web development technologies outside the scope of the HTML standard. This site covers the various technologies based on and related to HTML, not just the markup language itself. Its purpose is to provide a reference for current web development in HTML, including enhancements to HTML and other specifications related to the HTML development. The site does follow the practice what you preach principle by taking advantage of various new features in HTML 5. For example, each page is using the HTML 5 sectioning tags and the site logo in the upper left corner of each page is not an image - the logo is using an HTML 5 <canvas> tag with code loaded only once from a single full-site template. You can do View Source anywhere on the site to see the code for a working HTML demo page. This introduction to HTML coding is the first place to start for beginners learning to code web pages. To create a web page, it is important to understand the difference between tag and element in HTML in addition to the definitions of HTML terms. In all modern versions of HTML, the style of web design elements has been moved into HTML style sheets, while the focus of the HTML code is on the semantic content of the web pages. Tutorial on HTML ordered lists, unordered lists and definition lists. This tutorial shows how to use HTML Table Tags to layout data in a table on a web page. This tutorial shows how to create forms in HTML. The HTML Cheat Sheet is a quick reference of both valid and deprecated HTML tags while the HTML Tag Reference provides more detailed information on all the HTML elements. To determine what version of HTML a web page is actually using, enter its URL in the W3C Markup Validation Service and look for the Doctype. If it's not HTML5, change it to HTML5 in the drop-down box and then Revalidate. The pages on this site are Valid HTML 5. When can we start using HTML 5? Most current browsers already support many of the new features of HTML 5, so now is a good time to start to convert web site code to be compatible with HTML 5. See HTML 5 Browser Support for more detail. Who is developing the HTML 5 standard? One of the most significant differences between legacy HTML and HTML 5, and one of the biggest advantages of HTML 5 is that the specifications are being developed by a group consisting of the major browser developers who are actively implementing the HTML specifications, including Mozilla, Apple and Opera, with support from Microsoft. The W3C plans to eventually release the HTML 5 specifications as an official recommendation, but that is merely a formality since browser vendors are already busy implementing features of HTML 5 for use by their customers. Design patterns for HTML code. In addition to the many new features in HTML 5, there are over 20 new HTML tags introduced in this version. You may notice that, when there is a difference between the two possible flavors of HTML 5 syntax, rather than confusing things by presenting examples using both possible options, the syntax that is shown is one that could be used for documents that could be rendered by HTML browsers that interpret the input in either way. These are known as Polyglot HTML Documents. Modern browsers make it easy to check for updates and to upgrade to new browser versions and releases. Therefore, rather than creating a version with a lot of new features (along with any bugs!) over a fairly long period of time, development for many browsers is now using an evolutionary development model, with new functionality, such as support for HTML 5 features, constantly being added and released. There are a few known issues with some of the browsers. In Firefox for Windows, a page containing the <canvas> tag such as HTML <canvas> How To will not be rendered at all (Firefox Bug #647863). Firefox for the Mac will successfully display the page however. Internet Explorer 8 does not support HTML 5. Therefore, it is highly recommended to upgrade to IE 9.